It’s time to publish the statistics related to the main cyber attacks occurred in June and derived from the two corresponding timelines (Part I and Part II). The summer is here and apparently crooks are partially taking a break, since I collected 96 events (vs 116 in May), only partially justified by the shorter duration of the month. As usual, let’s start with the Daily Trend of Attacks chart, which shows a slow start and two pronounced peaks during the second and third week of the month. 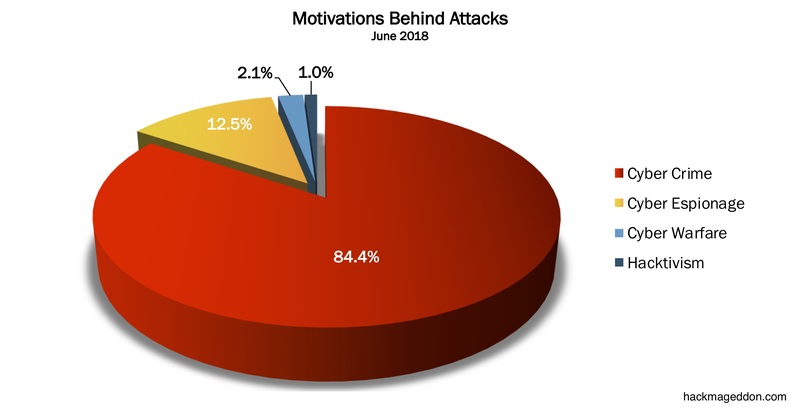 Nothing new under the sun, as Cyber Crime confirms its first position in the Motivations Behind Attacks, with 84.4% (it was 81% in May). Ahead of Cyber Espionage with 12.5% (it was 10.3%), Cyber Warfare (2.1% vs 5.2%), and Hacktivism (a tiny 1% in comparison with 3.4% of May). Malware is firmly stable on top of the Attack Vectors chart with 27.1% (it was 31.9% in May), ahead, among the known attack techniques, of Account Hijackings, stable at number two with 16.7% (it was 21.6% in May), and targeted attacks with 13.5% (it was 12.9% in May). Single Individuals rank on top of the Distribution of Targets chart with 20.8% (it was 18.1% the previous month). Multiple Industries slide to 15.6% from 18.1% in May). Similarly to May, Public administration, defence and social security rank at number three with 14.6% (up from 10.3% in May).